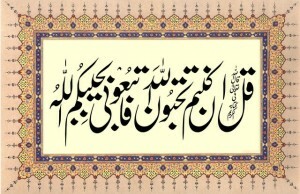 For a long duration I have been desiring to stay in your company for my spiritual betterment (islah). However, this wish has not fulfilled as yet. Concern for the household members and lack of resources have been the obstacle. Another more important reason to write to you is that sometimes individuals request that I accept their bayiah and let them join the path (silsila). I direct them to your respected person. To this they reply that it is beyond their capacity to travel there and (even if they go) Maulana (Hakim al Ummah) doesn’t accept their request and insists that they stay (there for islah). Hence, it is easier to join the path via you. This is not possible (for me to do) without having permission (ijazet) and permission is difficult (to achieve) without spiritual capability. These days most of the people insist unduly on ritualistic bayiah. I’m afraid that (because of it) they may be entrapped by the pseudo-Sufis (who contravene Shariah) and loose their faith. ‘Doing effort of spiritual betterment (islah) with an intention that I will (become a Shaikh and) accept bayiah is in vain. This individual will will never ever achieve spiritual betterment. His arrogance (kibr) will flourish. Repent from this. Only then effort for spiritual betterment will be effective. Asking for the ijazet fearing that people will be entrapped will eventually result in the same status this request was made to avoid (that is entrapment by incapable Shaikh). And if having capability is a must criteria then let it be clear that top most sign of capability is considering one’s self unworthy of this (responsibility). There is no possibility of getting this permission after all. This entry was posted in A. Reality of Tasawwuf, C. Blame worthy Morals, E. States, J. Rights , T. Tarbiyet on March 30, 2016 by 'abd.